Federal officials plan to ease restrictions on flying small drones over crowds and at night, which would give a boost to the commercial use of unmanned aircraft. The Federal Aviation Administration outlined draft rules Monday that would let drone operators do those things without a special waiver from current rules. For example, waivers for night flights would no longer be needed for operators who go through special training and put anti-collision lighting on their drones. It's not clear how long it might be before the FAA's easing goes into effect. The FAA said it won't take final action until it finishes another regulation regarding remote identification of small drones, which analysts say could be years away. Critics have charged that the FAA has stymied the commercial use of drones by taking the rigid approach to safety involving airliners and applying the same standard to the operation of small drones. Regulators say they are trying to balance the commercial possibilities of drones with the potential threat they pose to safety and privacy. Companies including CNN and insurance provider State Farm have won waivers to operate drones over people and out of the view of the device's operator. Pro-drone groups, however, argue that forcing companies to get waivers from the FAA is holding back beneficial technology for use in agriculture, energy and many other industries. A major trade group of drone users praised Monday's development. Brian Wynne, president of the Association for Unmanned Vehicle Systems International, said that allowing widespread operations over people without a waiver "will allow more operators to harness the great potential" of unmanned aircraft. Transportation Secretary Elaine Chao, whose department includes the FAA, sought to straddle the commerce-versus-safety debate. "The department is keenly aware that there are legitimate public concerns about drones," Chao said in remarks to a transportation group. The rules released Monday, she added, "will be a major step forward in enabling the safe development, testing and deployment of drones in our country." The proposal to let operators fly drones over crowds or at night without a special waiver will be put out for public comment as soon as possible. In its draft rules, the FAA proposed to divide drone operations by weight, the potential for each unmanned vehicle to cause injuries if it crashes, and other factors. Drones under 55 pounds (25 kilograms) would be permitted to fly over people if, on contact they would not produce severe injuries. Drone manufacturers could meet that standard by adjusting the weight, speed and materials they use, the FAA said. The FAA is grappling with questions such as whether to set minimum separation distances and maximum speeds for small drones weighing less than 55 pounds. The agency is not currently considering setting so-called stand-off distance requirements, which would require that small drones stay a certain distance from people. The agency said using precise numbers would be too burdensome to operators. The United Kingdom sets minimum distances, and Canadian and European regulators recently proposed them. 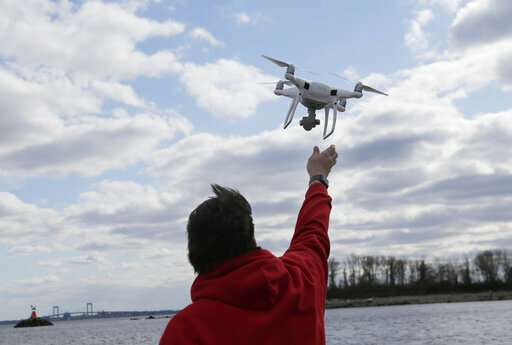 The agency is also working on a process to let owners of national-security sites, amusements parks and other places petition the FAA for a ban on drones near their properties. Rogue drones have been used to carry bombs on battlefields, to deliver contraband to prisoners, to interfere with firefighters and, last month, to cripple the operations of a major airport, Gatwick in London. Last year, Congress approved a measure that will let the government develop a system to identify and hack or shoot down drones that authorities deem threatening.